Great Story by Al Dronsfield!! “Lift Lock Plus! !”; this time in Scotland!! Al Dronfield Speaks: Stan’s latest article about locks and canal’s, etc. brought to mind a cruise that Jan and I took two years ago. https://theshuffler.net/2018/08/26/the-falkirk-wheel-is-a-rotating-boat-lift-in-central-scotland-connecting-the-forth-and-clyde-canal-with-the-union-canal/ It was a Princess cruise, the British Isle’s to be exact. Leaving out of Southampton our first stop was the Guernsey Island, England, we then stopped next in Cork, Ireland, Cobh. This was the last portage for the Titanic before it’s tragedy. Next to kiss the Blarney Stone at the Blarney Castle then on to Dublin and Belfast. I had a great interest in this cruise as I am kind of a history buff. The movie made by Mel Gibson called Braveheart is by far one of my favorites, with Scotland coming next. My camera and I were primed and ready to go. Oh, to see the Stirling Castle, the Wallace monument, Robert the Bruce statue, it was truly a grand experience. One of the great battles between William Wallace, the commoners and the clans tribes against Edward Longshanks was going to be the Battle of Falkirk. When I reached this area I had no idea what was in store. 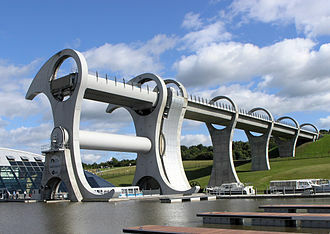 A grand surprise awaited us as there is a fantastic canal system, its call the Falkirk Wheel. This engineering marvel was so simple in design and it works so well. As I hope you can see in the pictures I took from the lower part of the canal, the wheel operates very much like a Ferris wheel, it rotates counter clock wise looking at it from where I was. You can see the canal ferries in a lock position. There are two of these ferry containing locks. All sorts of vessels use this system to navigate the canal system. At a very slow pace the wheel begins rotating to reach either the high or lower part of the canal. There are signal lights similar to traffic lights to control the movement of boats. We reached the upper canal and toured it briefly and then they turned us around and eventually navigating back into the lock from the upper canal. We eventually rotated in the wheel again back to the lower dock and the ride was complete. I highly recommend this tour if in the area. The cruise had other surprises as well. 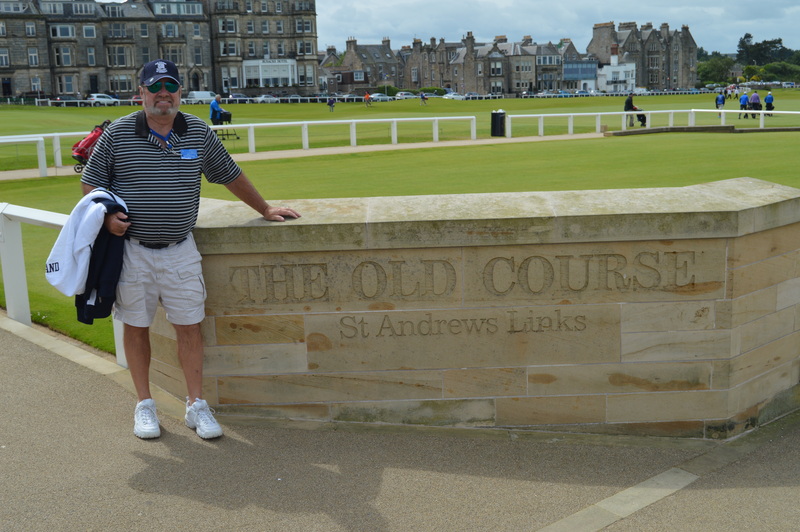 Being an avid golfer this trip would not have been complete without a stop at the Old Course, St. Andrews. 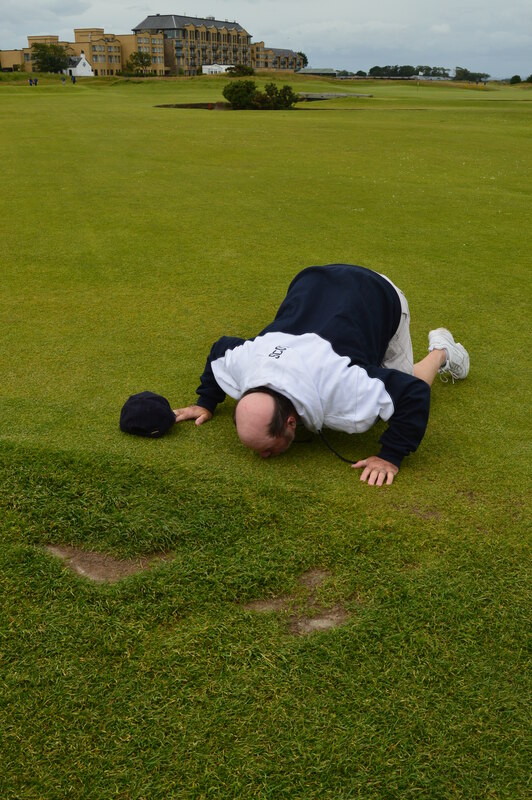 Just the opportunity to step foot on it’s turf, the birth place of golf was a dream come true. 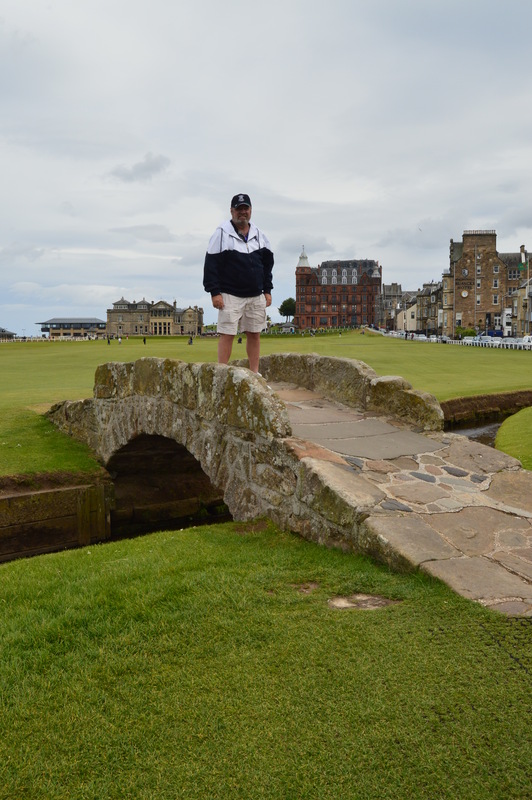 Walking down the 18th fairway to the Swilkin Bridge, walking across it and having pictures taken of me on it were so special, I also had pictures taken of me kneeling on the ground and kissing the hallowed ground. In my world this was the Holy Grail.. I do apologize for the glare while kissing the hallowed ground. Last stop was LaHavre, France, and this port has many places of interest from Paris to Normandy, etc. I choose the tour to the Notre Dame cathedral. What a site, the medieval architecture was unbelievable, how did they accomplish this back in that era?? Fascinating for sure. I did get carried away here as the point of the story was the Falkirk Wheel. Written by Al Dronsfield 8/26/18. Posted by Stan on 2018 08 26. Many thanks Al!! !